This bright and colourful sign starts off with a paint splat shape of card. 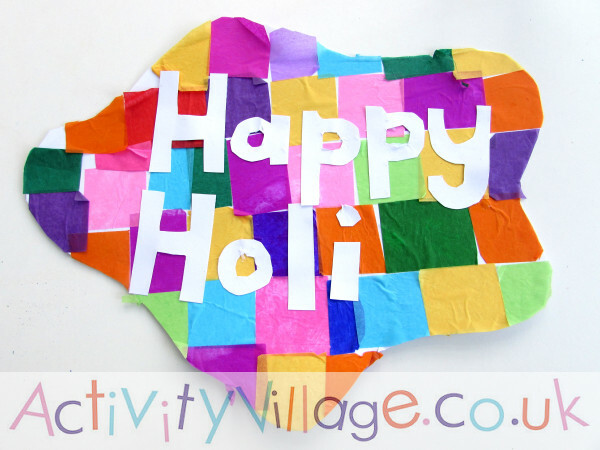 Younger children will enjoy covering it with a mosaic of tissue paper and adding it to your Holi displays. It's a (relatively) mess-free Holi craft activity! Cut a paint splat shape from the card. Glue tissue paper squares all over the cut out shape. Trim around the outside. Cut out the letters to say Happy Holi from white card and glue them to the sign.